Preparation of Pu’er involves first separating a well-sized portion of the compressed tea for brewing. This can be done by flaking off pieces of the cake or by steaming the entire cake until it is soft from heat and hydration. A Pu’er knife, which is similar to an oyster knife or a rigid letter opener, is used to pry large horizontal flakes of tea off the cake such as to minimize leaf breakage. Steaming is usually performed on smaller teas such as tuocha or mushroom Pu’er and involves steaming the cake until it can be rubbed apart and then dried. In both cases, a vertical sampling of the cake should be obtained since the quality of the leaves in a cake usually varies between the surface and the center of the cake. Pu’er is generally expected to be served Gongfu style, generally in Yixing teaware or in a type of Chinese teacup called a gaiwan. Optimum temperatures are generally regarded to be around 95 degree Celsius for lower quality Pu’er and 85-89 degree Celsius for good ripened and aged raw Pu’er. Steeping times last from 12-30 seconds in the first few infusions, up to 2-10 minutes in the last infusions. The prolonged steeping techniques used by some western tea makers can produce dark, bitter, and unpleasant brews. Quality aged Pu’er can yield many more infusions, with different flavour nuances when brewed in the traditional Gong-Fu method. Because of the prolonged fermentation in ripened Pu’er and slow oxidization of aged raw Pu’er, these teas often lack the bitter, astringent properties of other tea types, and also can be brewed much stronger and repeatedly, with some claiming 20 or more infusions of tea from one pot of leaves. On the other hand, young raw Pu’er is known and expected to be strong and aromatic, yet very bitter and somewhat astringent when brewed, since these characteristics are believed to produce better aged raw Pu’er. · Liquor: The tea liquor of both raw and ripe Pu’er should never appear cloudy. Well-aged raw Pu’er and well-crafted ripe Pu’er tea may produce a dark reddish liquor, reminiscent of a dried jujube, but in either case the liquor should not be opaque, "muddy," or black in colour. The flavours of Pu’er liquors should persist and be revealed throughout separate or subsequent infusions, and never abruptly disappear, since this could be the sign of added flavorants. · Young raw Pu’er:The ideal liquors should be aromatic with a light but distinct odours of camphor, rich herbal notes like Chinese medicine, fragrance floral notes, hints of dried fruit aromas such as preserved plums, and should exhibit only some grassy notes to the likes of fresh sencha. Young raw Pu’er may sometimes be quite bitter and astringent, but should also exhibit a pleasant mouthfeel and "sweet" aftertaste, referred to as gān (甘) and húigān(回甘). 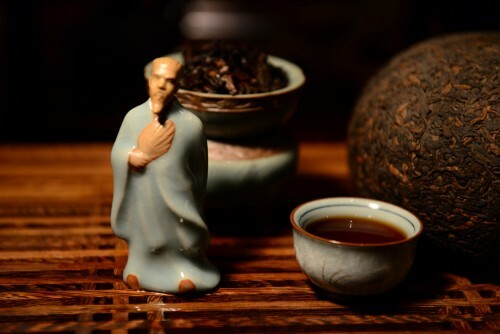 · Aged raw Pu’er: Aged Pu’er should never smell moldy, musty, or strongly fungal, though some Pu’er drinkers considers these smells to be unoffensive or even enjoyable. The smell of aged Pu’er may vary, with an "aged" but not "stuffy" odour. The taste of aged raw Pu’er or ripe Pu’er should be smooth, with slight hints of bitterness, and lack a biting astringency or any off-sour tastes. The element of taste is an important indicator of aged Pu’er quality, the texture should be rich and thick and should have very distinct gān (甘) and húigān(回甘) on the tongue and cheeks, which together induces salivation and leaves a "feeling" in the back of the throat. · Spent tea: Whole leaves and leave bud systems should be easily seen and picked out of the wet spent tea, with a limited amount of broken fragments. Twigs, and the fruits of the tea plant should not be found in the spent tea leaves, however animal (and human) hair, strings, rice grains and chaff may occasionally be included in the tea. The leaves should not crumble when rubbed, and with ripened Pu’er, it should not resemble compost. Aged raw puerh should have leaves that unfurl when brewed while leaves of most ripened puerh will generally remain closed. In Cantonese culture, Pu’er is known as po-lay (or bo-lay) tea. Among the Cantonese long settled in California, it is called bo-nay or po-nay tea. It is often drunk during dim sum meals, as it is believed to help with digestion. It is not uncommon to add dried osmanthus flowers, pomelo rinds, or chrysanthemum flowers into brewing Pu’er tea in order to add a light, fresh fragrance to the tea liquor. Pu’er with chrysanthemum is the most common pairing, and referred as guk pou or guk bou (菊普; pinyin: jú pǔ). Pu’er is considered to have some medicinal qualities. Sometimes wolfberries are brewed with the tea, plumpening in the process.